Home » »Unlabelled » Is Baptism Necessary for Salvation? I have been asked this question by many and I felt like it needed to be addressed. John MacArthur does an amazing job of unpacking all of this topic in a magnificent way. If water baptism were necessary for salvation, we would expect to find it stressed whenever the gospel is presented in Scripture. That is not the case, however. Peter mentioned baptism in his sermon on the day of Pentecost (Acts 2:38). However, in his sermon from Solomon’s portico in the Temple (Acts 3:12-26), Peter makes no reference to baptism, but links forgiveness of sin to repentance (3:19). If baptism is necessary for the forgiveness of sin, why didn’t Peter say so in Acts 3? Paul never made water baptism any part of his gospel presentations. In 1 Corinthians 15:1-4, Paul gives a concise summary of the gospel message he preached. There is no mention of baptism. In 1 Corinthians 1:17, Paul states that “Christ did not send me to baptize, but to preach the gospel,” thus clearly differentiating the gospel from baptism. Perhaps the most convincing refutation of the view that baptism is necessary for salvation are those who were saved apart from baptism. The penitent woman (Luke 7:37-50), the paralytic man (Matthew 9:2), the publican (Luke 18:13-14), and the thief on the cross (Luke 23:39-43) all experienced forgiveness of sins apart from baptism. For that matter, we have no record of the apostles’ being baptized, yet Jesus pronounced them clean of their sins (John 15:3—note that the Word of God, not baptism, is what cleansed them). The Bible also gives us an example of people who were saved before being baptized. In Acts 10:44-48, Cornelius and those with him were converted through Peter’s message. That they were saved before being baptized is evident from their reception of the Holy Spirit (v. 44) and the gifts of the Spirit (v. 46) before their baptism. Indeed, it is the fact that they had received the Holy Spirit (and hence were saved) that led Peter to baptize them (cf. v. 47). One of the basic principles of biblical interpretation is the analogia scriptura, the analogy of Scripture—we must compare Scripture with Scripture in order to understand its full and proper sense. Since the Bible doesn’t contradict itself, any interpretation of a specific passage that contradicts the general teaching of the Bible is to be rejected. With that in mind, let’s look briefly at some passages that appear to teach that baptism is required for salvation. In Acts 2:38, Peter appears to link forgiveness of sins to baptism. But there are several plausible interpretations of this verse that do not connect forgiveness of sin with baptism. It is possible to translate the Greek preposition eis—”because of,” or “on the basis of,” instead of “for.” It is used in that sense in Matthew 3:11; 12:41; and Luke 11:32. It is also possible to take the clause “and let each of you be baptized in the name of Jesus Christ” as parenthetical. Support for that interpretation comes from that fact that “repent” and “your” are plural, while “be baptized” is singular, thus setting it off from the rest of the sentence. If that interpretation is correct, the verse would read “Repent (and let each of you be baptized in the name of Jesus Christ) for the forgiveness of your sins.” Forgiveness is thus connected with repentance, not baptism, in keeping with the consistent teaching of the New Testament (cf. Luke 24:47; John 3:18; Acts 5:31; 10:43; 13:38; 26:18; Ephesians 5:26). It is possible that to a first-century Jewish audience (as well as to Peter), the idea of baptism might incorporate both the spiritual reality and the physical symbol. 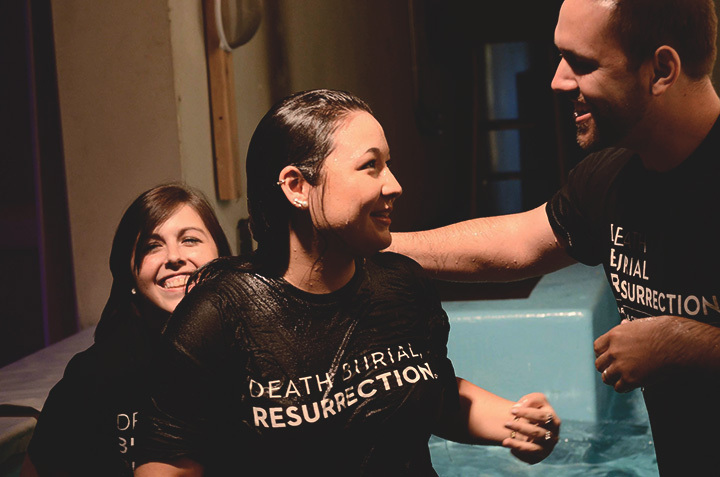 In other words, when one spoke of baptism, he usually meant both ideas—the reality and the ritual. Peter is shown to make the strong connection between these two in chapters 10 and 11. In 11:15-16 he recounts the conversion of Cornelius and friends, pointing out that at the point of their conversion they were baptized by the Holy Spirit. After he had seen this, he declared, “Surely no one can refuse the water for these to be baptized who have received the Holy Spirit…” (10:47). I might also mention that many textual scholars think it unlikely that vv. 9-20 are an authentic part of Mark’s gospel. We can’t discuss here all the textual evidence that has caused many New Testament scholars to reject the passage. But you can find a thorough discussion in Bruce Metzger, et al., A Textual Commentary on the Greek New Testament, pp. 122-128, and William Hendriksen, The Gospel of Mark, pp. 682-687. Water baptism does not seem to be what Peter has in view in 1 Peter 3:21. The English word “baptism” is simply a transliteration of the Greek word baptizo, which means “to immerse.” Baptizo does not always refer to water baptism in the New Testament (cf. Matthew 3:11; Mark 1:8; 7:4; 10:38-39; Luke 3:16; 11:38; 12:50; John 1:33; Acts 1:5; 11:16; 1 Corinthians 10:2; 12:13). So Peter is not talking about immersion in water, as the phrase “not the removal of dirt from the flesh” indicates. He is referring to immersion in Christ’s death and resurrection through “an appeal to God for a good conscience,” or repentance. Again, it is not the outward act that saves, but the internal reality of the Spirit’s regenerating work (cf. Titus 3:4-8). In Acts 22:16, Paul recounts the words of Ananias to him following his experience on the Damascus road: “Arise, and be baptized, and wash away your sins, calling on His name.” It is best to connect the phrase “wash away your sins” with “calling on His name.” If we connect it with “be baptized,” the Greek participle epikalesamenos (”calling”) would have no antecedent. Paul’s sins were washed away not by baptism, but by calling on His name. This article originally appeared at Grace to You. © 2007 Grace to You. All rights reserved. Used by permission.